Ok, so I recently learned about tape/strip diagrams. These simple little diagrams go by so many names! You may have heard them called bar models and part-part-whole boxes (in younger grades). In a nutshell, the diagrams help students look at part-whole relationships when problem solving. What I really like about them is that they provide a visual for students and help build algebraic thinking skills. 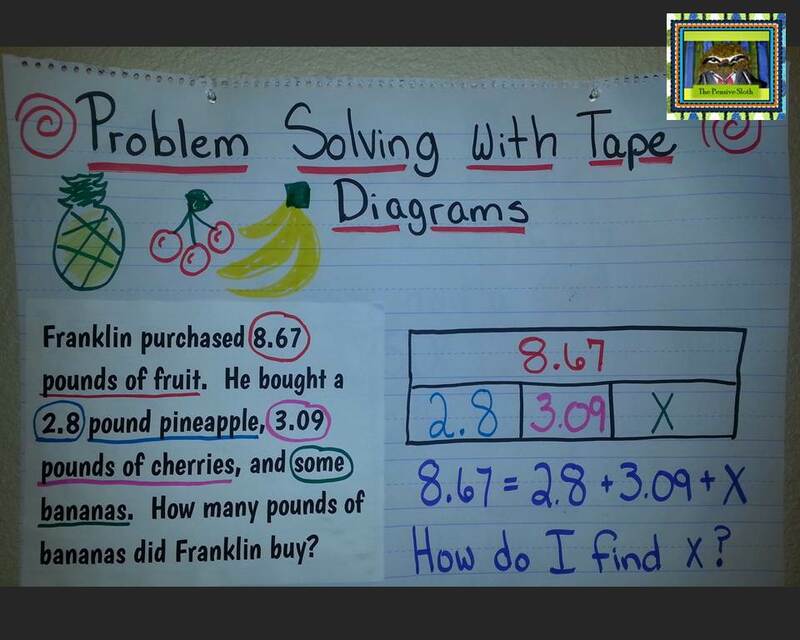 Use strip/tape diagrams to boost algebraic thinking skills with your upper elementary math students. 1–Model using them to solve word problems. Model a lot! Students need to see how they can be applied in a variety of problems, to identify when the whole is missing and when a part is missing, so they can internalize this strategy. You can start simple with problems that have 2 parts and build from there. 2–Use them with the skills for your grade level. In first and second grade, students may be using them with one and two digit numbers. But, in the upper grades they can be applied to adding and subtracting with decimals and multiple digit numbers. 3–The beauty of these diagrams is that they don’t give the kids an equation to solve. The student has to come up with the equation! Kids have to manipulate the numbers in their mind to build the equation, especially when one part is missing. Make kids write the equation they used to isolate the missing variable, X. This really gets them thinking! The diagrams are nothing new. They’ve been around for years, but they seem to be resurfacing because they have been referenced recently in the standards. In Texas (where I teach) they can be found in the new math TEKS in 3rd and 4th grade. Texas calls them strip diagrams. They are also referenced in Common Core. To be honest, when using them with my 5th graders I use the word TAPE DIAGRAM on purpose, not STRIP DIAGRAM. If you teach 5th grade, you understand why! PS– If you are interested in some task cards for tape/strip diagrams, I put together a set for my students to practice adding and subtracting decimals. There are 3 sets of task cards in this pack for a total of 72 task cards. Plus, they have QR codes so students can self check! A non-QR code version is also included. Looking for practice activities for your students using strip/tape diagrams? Check out this set from my TPT store.